Until further notice, the Big 12 belongs to the no. 7 Kansas Jayhawks. Monday night’s win over no. 3 Baylor — before tip-off, one of three undefeated teams in America — was so dominant that it bulldozed the old axiom about over-valuing one win. Because this wasn’t just a win; it was a mighty shellacking. A mighty shellacking, you say? Oh yeah. Believe me, I thought long and hard before choosing that phrase. I think it was last used by a dude named Jedediah to describe a lopsided mule race at a county fair in the 1870s. But today, it fits. Baylor got flat-out embarrassed, and by my reckoning, the Jayhawk pyrotechnic display was the single best offensive showing by any team this season, all circumstances considered. As far as tone-setters go, not too bad, right? That was Thomas Robinson on the jam, the 6-foot-10 junior who finished with 27 points and 14 boards, and who is now one of the front-runners for national player of the year. He dominated all game long with dunks and spins and ferocious boards, and he did it against one of the best front lines in the country. Baylor is absolutely stacked down low, with three premier bigs (6-foot-9 Quincy Miller, 6-foot-7 Quincy Acy, and 6-foot-11 Perry Jones III) who should (read: should) dominate every game. But it didn’t work out that way in Lawrence. Instead, Robinson combined with Jeff Withey to completely outclass the Bears. Withey is a 7-footer, ranked third nationally in block percentage, and he grabbed nine offensive boards over the Baylor trio. But wherefore this humiliation? How did Kansas put up an offensive efficiency of 129.6 (for the statistically uninitiated, that means the Jayhawks would have scored 129.6 points if given 100 possessions), its second-highest total of the year and the best since a season-opening 100-54 romp over Towson? How was it possible against the 16th-best defense in the country, against a team with a 17-0 record and a Top 5 ranking? There are quite a few answers, actually. Let’s start with the Four Factors from our pals at Stat Sheet. You notice right away that the biggest discrepancy comes in the offensive rebounding department. Kansas gave itself a second chance on 48.4 percent of all shots, an absurdly high number. Baylor likes to play a 2-3 zone that can morph into a 3-2 and even a 1-3-1, and offensive boards are an occupational hazard of that defensive style. For evidence, you only have to look at one of the other undefeated teams, Syracuse. The Orange employ the zone defense, and despite boasting the 10th-best defense in the country, they are a woeful 319th on the offensive glass. Coaches understand that when you play a zone, you’ll give up more rebounds simply because defenders won’t always have a specific man to box out. The attacking team has more freedom to maneuver when the shot goes up, and that leads to more second chances. So being out-rebounded by a fair margin isn’t too critical for a zone-based defense. You take the good with the bad. As you see by the records, it wasn’t a problem for Syracuse or Baylor. 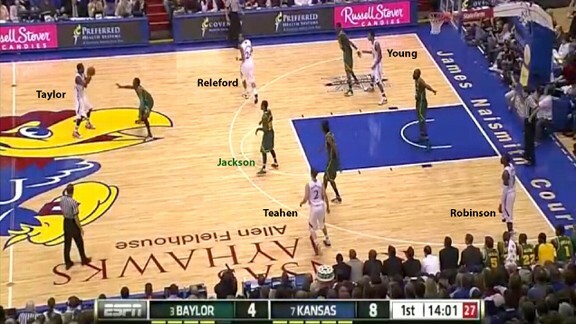 With Robinson and Withey patrolling the glass, though, the problem was exacerbated for Baylor. The Bears normally give up an offensive board on one-third of all shots (33.6 percent), but on Monday night, that went up to nearly half. Giving up those extra chances to the Jayhawks was especially problematic, because for the bulk of the game they didn’t even need the help. Bears coach Scott Drew has a perfect team for the zone — fast, long, and athletic — but Kansas exploited the weakness with unbelievable precision. Let’s look at a quick example from the first half. Here, you see Baylor is playing a zone defense that looks like a 1-3-1. 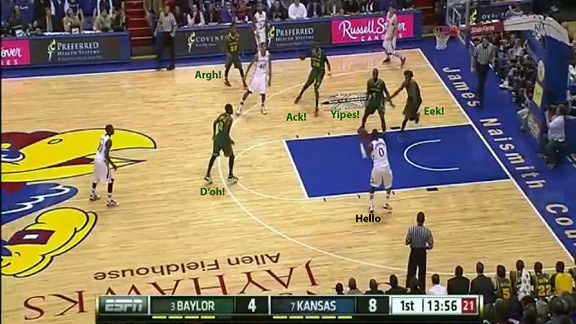 Each type of zone leaves open space in one part of the court, and already Kansas had exploited the open foul line area in Baylor’s 2-3. Drew adjusted to the 1-3-1 so that the foul line is patrolled by the middle man in the second line. In this case, that was Pierre Jackson. It’s a smart adjustment, but the 1-3-1 isn’t a miracle cure; instead of the foul line, it leaves open space in the corners. Kansas has a plan to exploit that weakness. Notice that Robinson starts off by himself in the right corner — an unlikely spot for a player who makes his bones in the paint. But it’s not an accident. Tyshawn Taylor, who had one of the best games of his career, recognizes the 1-3-1. 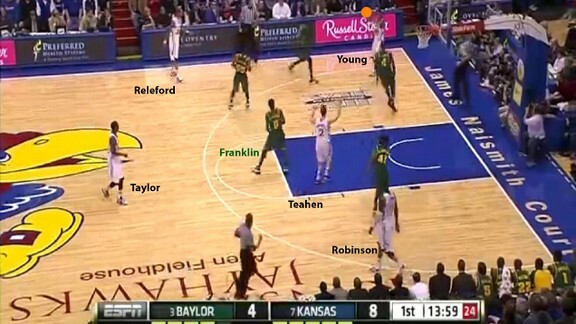 Taylor passes to Travis Releford on the wing, and Baylor’s Quincy Miller rushes up to meet him. The Jayhawks knew that would happen, and Kevin Young is where’s he meant to be, open in the corner. Young is 6-foot-8, the second-tallest player on the court after Robinson, and it’ll be obvious in a second why Kansas coach Bill Self has his two biggest men in the corner. On the other wing, notice that Teahen is about to slash into the lane, while Robinson is shifting up. Young receives the pass, and if he had reacted quickly enough, he would have found Teahen for a relatively easy layup. Baylor’s Gary Franklin was the top man in the 1-3-1, and as the ball shifts it is his job to sag down and prevent that cut. He doesn’t do it quickly enough, and Teahen is open as Anthony Jones has to pay attention to Robinson behind him. Young doesn’t pull the trigger on the pass, but it’s not a critical mistake. 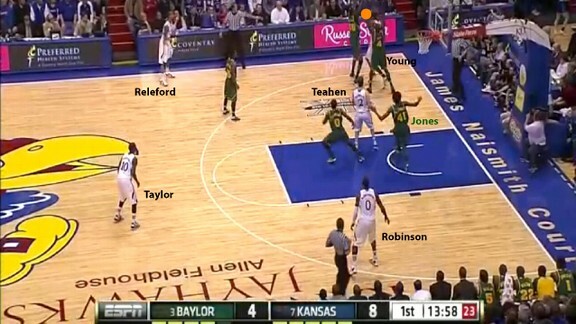 The Baylor zone has been pulled all the way to the left, and Kansas’ best scorer is behind them. One of the main philosophies of zone offense (some credit Bobby Knight on this one) is to always bring players from behind. Young’s hesitation brings on the double team, and you can see why Self wants his tall players in the corner. A smaller player in that situation might be prone to a turnover, but Young, who is also a threat to dribble, finds himself in less danger. It’s also becoming clear why they went to Young’s side; notice Robinson creeping up to the wing. He’s about to become a primary scoring threat from behind the flow of the zone. And one last point: As a result of Teahen’s strong cut, Anthony Jones now has to pick him up. Robinson is completely unregarded. 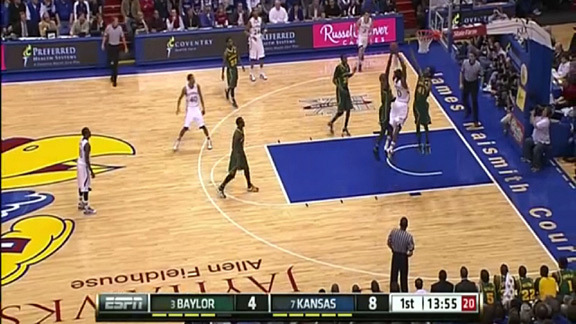 Young beats the double team with a dribble, and ALL FIVE Baylor defenders are on the right side of the court. Three of them, marked above, are stacked in the right corner. The double-team isn’t a terrible strategy, but when a player can break it with the ease that Young did, a perceived advantage is quickly turned into a disaster. When he beats his defender, Young is smart enough to attack the middle rather than continuing outside. It doesn’t take much to see how this play is ending. Hey, Baylor, remember Thomas Robinson? He’s the player of the year candidate. He’s also the man with momentum, cutting into the lane, with a clear path to the basket. In the parlance of the night, y’all screwed. For Kansas, it was that easy all night. The bad news for Baylor is that this will serve as a blueprint for every future opponent this season. The good news is that Kansas’ win was predicated on intelligence and skill. Without Young’s ability to beat the double team, that easy basket doesn’t happen. Not every team will have the weapons the Jayhawks have, so it’s not like this knowledge alone relegates Baylor to a slew of bad losses. At the start of this play, it looks like Baylor has switched to man-to-man. It wouldn’t have been a surprise; they’re known to play man on occasion, and Kansas’ success against the zone forced them to do it more often last night. 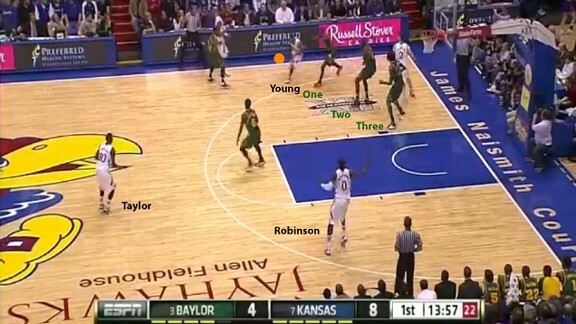 On the other hand, Baylor’s 3-2 zone can look an awful lot like a man at times. To figure it out, and to waste time with a lead, Kansas runs a weave on the perimeter. Although Baylor switches on every pick, it still seems like a man-to-man underneath. 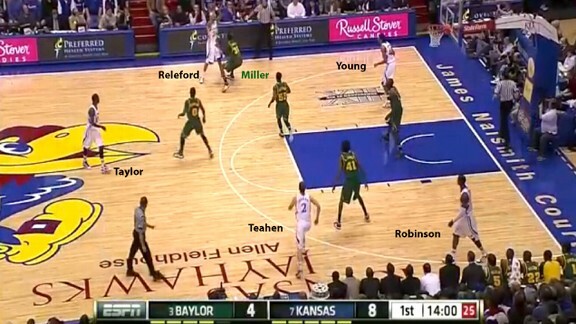 Armed with that information, Taylor and Withey set up a pick-and-roll on the right wing. What happens next is a small disaster for Baylor. Quincy Acy hedges, like he’s supposed to, and Jackson follows Taylor, like he’s supposed to. But Acy doesn’t retreat to his man, Withey, after the hedge. This seems like a good time to point out that Acy had a truly awful defensive game, looking lost over and over as Kansas exploited his confusion. By forgetting that his team is playing a man-to-man defense, or ignoring the fact that a big man has to retreat to his own guy after a hedge on a pick-and-roll, he leaves Withey wide open. Taylor curls around Acy and feeds the big man for the easy slam. As with Young in the play diagrammed above, Taylor gets by Quincy Acy. Here, he has to read Quincy Miller’s body language. As the help-side defender, Miller has to choose whether to step in and stop Taylor’s penetration, or stay with his man, Releford. Taylor, with the ball, is taught to attack the help defender’s inside shoulder and to read his outside foot. If Miller had shifted over, bringing his right foot into the lane to stop the drive, the ball would have been kicked out to Releford for an open look. But against a player as quick as Taylor, Miller’s hesitation is fatal. He can only give a lame step toward the ball, but Taylor is already into the lane and ready to throw the alley-oop. Was it bad defense? Sure. But it was a highly intelligent and athletic play by Taylor. A player like that can make any defender look hapless. And it shows how a small mistake — in this case, Acy’s clueless pick-and-roll defense — can translate to an easy basket against an efficient offense. Baylor’s breakdowns weren’t the only reason behind the lopsided final margin. The offensive rebounds played a part, as did the Jayhawks’ ability to fast break at will. And, of course, Allen Fieldhouse is a nightmare venue for an opponent. But the fact is, Bill Self went to war with one of his least talented teams in recent memory — and still embarrassed the third-ranked team in the country. It was a coaching job worthy of his reputation, and after a few early losses, it should make us all reconsider the nature of the Jayhawks. Conference play is barely under way, but there’s a blooming juggernaut in the Big 12.